Invention Geek – Smiley Face? I am always seeing those yellow smiley face images and I was wondering who designed the graphic? Was it ever trademarked? Hello Corra. Those smiley face images are on everything from t-shirts to ads. The yellow circle with eyes and a smile that can be seen almost everywhere was designed by a freelance artist for State Mutual Life Assurance in 1963. The company had merged with another insurance company and employee morale was low. In order to improve feelings among the employees, Harvey Ball was asked to create a smiley face to be used on company buttons, letterheads and posters. Ball designed the smiley face in ten minutes and received forty-five dollars for his work. He never tried to sell, trademark or profit from his logo. The graphic fell into the public domain. Then in 1970, the graphic was made popular by two brothers, Murray and Bernard Spain. Bernard drew the smiley face and Murray added the phrase “Have a happy day.” The brothers trademarked their new graphic and began producing products from T-shirts to cookie jars with the smiley. The smiley face and these products quickly became a fad. 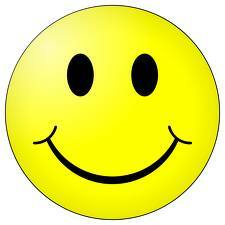 By 1972, more than 50 million smiley face buttons had been produced. Murray and Bernard Spain greatly profited from this trend. The original designer of the smiley did not. He never received any monetary rewards from the design beyond the original forty-five dollar paycheck.